Ramen, lo mein, chow mein. We all have our favorite noodle dishes. With such diverse culture in New York state comes a colorful variety in its cuisine. So if you’re in the mood for a hot bowl of noodles, your selection is huge. Whether you’re craving world-class ramen in the heart of the city or delicious pho upstate, we’ve got it. 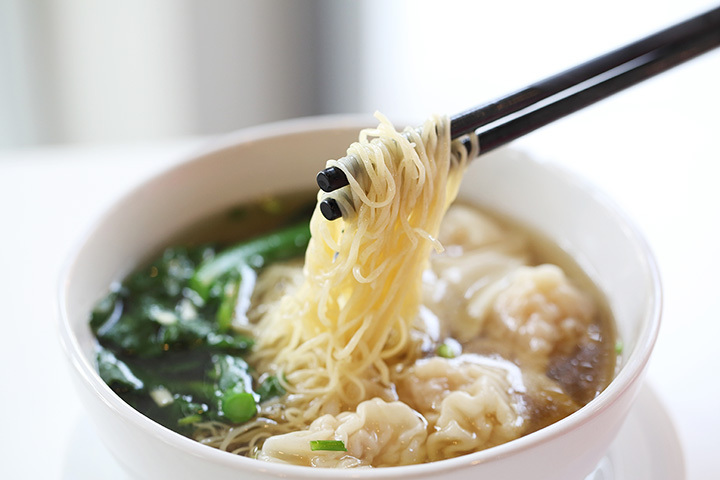 Here are the best noodle places in New York! Sadudee has ten different options you can choose to have served with white rice or rice noodles, such as Pad Thai (a thin rice noodle dish with ground peanut), Pad See Eew (flat rice noodles with egg, broccoli, carrot, and soy sauce), Kao Soi (soft linguini in a yellow curry sauce), and Pad Kee Mao (flat rice noodles with red and green pepper and spicy basil sauce). Dishes start at $8 for lunch and $12 for dinner, and prices increase based on your option of meat. RameNesque has an additional location in Thornwood, New York, so be sure to check the menu and make sure you’ve got the right location picked out. The location in Peekskill has six different ramen dishes, from Shoyu Ramen (with a traditional soy sauce flavor) to Dan Dan Ramen (made in a spicy sesame and bean paste broth) to Nin’Niku Ramen (with roasted garlic). Momofuku is owned by David Chang and serves a changing menu of noodles, steamed bread, and daily dishes. Their ramen dishes are served with Momofuku barley noodles and start at $15. Bowls include spicy beef ramen, garlic chicken ramen, smoked pork ramen, ginger scallion noodles, and mixed spicy noodles. The Bamboo House has lo mein and Pad Thai options to choose from, depending on whether you’re in the mood for egg noodles or rice noodles (respectively). Lo mein dishes include noodles with vegetables, and the Pad Thai includes egg, peanut, tofu, and vegetables. Each dish comes with your choice of beef, chicken, shrimp, pork, vegetable, or a house special. Furoshiki regards itself as serving “Asian-inspired comfort food.” Their kitchen is open until 10 p.m. every night. They make their ramen bowls in a slow simmered broth. Prices start at $9.50 for Miso ramen, with your choice of pork bone or veggie broth. You can choose from eight add-ins for your dishes, each adding to the price but also to the intricacy of the meal. Tanpopo Ramen and Sake Bar is regarded as the best ramen restaurant in Albany. You can choose from a selection of appetizers and salads, but the ramen is the star. There are six different ramen bowls available, including vegetable ramen, roast duck ramen, and beef stew ramen. There are seven additional toppings you can add, too: seasoned boiled egg, chashu pork, kikurage mushroom, noodle, bamboo, spicy, and corn. Eng’s has 11 soft egg noodle dishes, including lo mein and chow mein options. You can choose from chicken, pork, shrimp, beef, curry beef, vegetable, and a cold sesame noodle dish. Eng’s has daily lunch special combination plates from 11 a.m. to 3 p.m., and you can get dishes starting at $5.50 each. Slurp Ramen has seven ramen bowl dishes to choose from, starting at $10.45. If you’re new, check out the Slurp Classic: ramen with slow-cooked chashu pork belly, scallions, red ginger, and slurp egg. If you like spicy, try your hand at their Curry Ramen: a full-bodied pork soup with Japanese-style curry, fried onion chips, scallions, and chopped chashu pork belly. Pho Yum is a family-owned Vietnamese restaurant. They have locations in Albany and Colonie and are hoping to serve you delicious food that doesn’t break the bank. Their pho is made with rice noodles and made in a beef broth. It’s served with a side of bean sprouts, basil, jalapeno, lime, Hoisin sauce and Sriracha. There are 12 different add-ins to choose from, including beef meatballs, beef tripe, shrimp, and tofu. Saigon Cafe has seven noodle dishes to pick from, each costing $11.99. They’re a perfect addition to your dinner, whether you’re having the Pad Thai or the Curry Udon (a noodle dish with fresh vegetables in a red curry and coconut sauce). In addition to the Curry Udon, the Basil Noodle and Pad See-Ew come with your choice of meat. Their saigon-style dish, Crazy Noodles, is made with fresh flat noodles and served with mixed vegetables and tossed in a white pepper ginger sauce.